Among the most common wildlife in suburban backyards, squirrels and chipmunks are both members of the squirrel family, but you'd never mistake one for the other. Each plays its role in the local ecosystem. Chipmunks aid forest growth when they move seeds around, while squirrels are indirectly responsible for great forests, resulting from hiding their acorns. Obviously, squirrels are much larger than chipmunks. Squirrel size depends on species, with gray squirrels maturing between 18 and 20 inches long, weighing 1.5 pounds. Red squirrels are about half that size. Fox squirrels live in northern climate. Named for their coloration, which resembles the red fox, these squirrels are slightly longer than the gray squirrel and can weigh 2 pounds. Chipmunks weigh between 2 to 4 ounces at maturity, with an average length of 5 inches. They're brown with tan, black and brown striping. 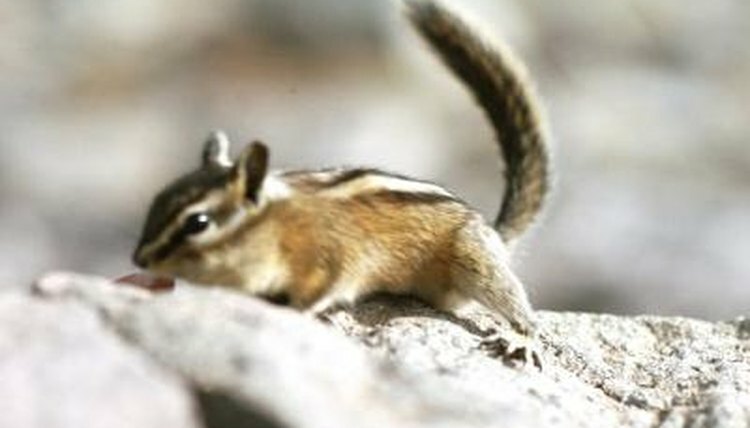 Chipmunks live underground, digging burrows up to 30 feet long. Their preferred habitat consists of mature woodlands or along their edges, which describes many suburban neighborhoods. According to Ohio State University, the chipmunk's range is about half an acre, but they will only defend an area about 50 feet from their burrow's entrance. Most squirrel species nest in trees, with the red types often using cavities as the home of choice for raising young. Gray and fox squirrels build nests made of leaves, twigs and bark. Squirrels also live in woodlands, but red squirrels prefer coniferous forests, while gray and fox squirrels prefer deciduous trees. Chipmunks mate twice a year, in early spring and late summer. After a gestation period of 31 days, the female produces a litter of two to five offspring. Gray squirrels breed in early winter, with some females breeding again in early summer. After a gestation period of between 42 to 35 days, the female gives birth to three babies, on average. Fox squirrels have the same gestation period, but only breed in early winter, with a resulting litter of between two and four young. Red female squirrels, mating in late winter, deliver three to six babies in the spring after a 40-day gestation. Squirrels are far more likely to earn the term "nuisance wildlife" than chipmunks. If you put out a bird feeder without a squirrel baffle, you know you're probably feeding more squirrels than feathered friends. Squirrels often enter homes, especially attics, to store food or find a place to live. You might also find squirrels dwelling in your chimney. They can cause some damage, as well making noise and spreading filth. You'll need to call an exterminator to get rid of them. Did you ever lose power because a squirrel got zapped in a transformer? While they can problems by burrowing around the foundation, chipmunks are much less likely to enter your house, causing fewer issues if they do get inside. If you've got a cat in your house, the chipmunk is toast.